Alphy9250 had the most liked content! There is only one reverse light standard. Hey mate I'm trying to make a donation for the sticker but having issues. All it let's me do is buy a supporter 2016. Should I just do this again? Hey I paid my $15 the other day. Just wondering if that gives me enough street cred to get a OZRS sticker for my car??? Don't worry!! Sorted it online on my laptop!! I must be a retard but I can't find the "store"! I wanna contribute and also get a OZRS sticker for my car! I'm using this tapatalk app on my phone. Don't know if that's why I can't find it anywhere! Window Tint On A New Megane Rs Cup 265.. 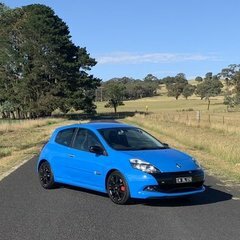 I did my Clio Cup with tint a car. I had 20% put on the front and 35% on the rear. It all matches well. Thanks cloudy! I read this after I did it. I ended up going with red cause didn't have any responses and I like to make rash decisions! Oh and also the front spoiler is no longer silver, had it sprayed black. Hey guys. I'm dipping the RS logo on the front of my white Clio Cup. I need some help from members on the right color. I'm changing it from the chrome and am thinking between black, white or red. That way can tie in with the other colors on the car. Any help would be greatly appreciated! Sorry failed to mention I've done the renault logo in black!